GM3000♻ is an economical grade made with a blend of prime and reprocessed resins. GM3000♻ geomembranes are economical lining materials made from blended/reprocessed resins selected for optimum performance at the lowest cost. 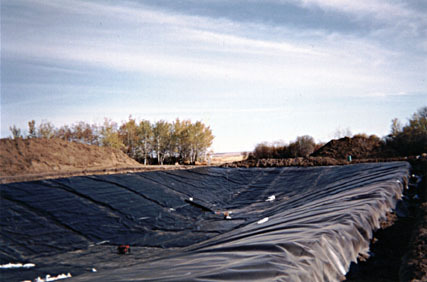 GM3000♻ products are intended for use in geomembrane applications such as oil and gas reserve pits, temporary containment of frac water, seepage control, water containment and short-term protective covers. Prefabricated liners are also ideal for installation by contractors, owners, or agricultural operators. The GM3000♻ series is the most economical member of Layfield's Enviro Liner® group of products. The GM3000♻ series is an excellent choice for temporary storage of contaminated soils, such as remediation projects. GM3000♻ series geomembranes are not intended for prolonged exposed use, if you require service with prolonged exposure to natural weathering we suggest you consider the Enviro Liner® 6000x series. Enviro Liner® 1000 geoembrane is a flexible membrane liner that has been developed for the containment of drilling fluids and water used in hydraulic fracturing operations. Layfield's HAZGARD® brand of geomembranes is specially designed to meet your requirements in secondary containment applications.